Big News. Big Launch. Bakesmiths is Open. 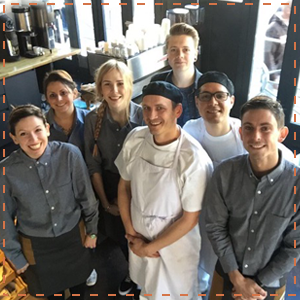 A new chapter in the Cakesmiths story began today, as we joined the booming coffee shop market with the launch of Bakesmiths in Bristol. Like Cakesmiths, baking and fresh, handmade produce is at the heart of everything we do at Bakesmiths, with a full working bakery – so customers can watch our bakers in action and enjoy the delicious baking smells - alongside a coffee shop and roaster. But one of the most exciting developments for you is that the Cakesmiths Innovation Kitchen will be based at Bakesmiths, putting us in the heart of café culture to inspire our new cake creations and enhance our signature lines too. With a ready-made audience to test, trial and feedback on our new ideas for bakes, you can be doubly sure Cakesmiths cakes will pass the most demanding of customer taste tests.